Today, Helen and I wrote my one-page profile, something Helen will use to understand me in our person-centred journey and importantly, a way of really getting me to think about who I am, what is important to me and what I need in terms of support. This might sound like a bit of an odd thing to do, especially if you are someone who is fairly confident that they understand themselves (as I was) but it wasn’t until I really started hammering down on some of the points, that I realised that actually the things that are important to me sometimes conflict with my self-image. For example; I’d like to think I am independent and self-reliant and yet when I started writing down how I spend my time, what makes me happy and who is in my circle of support, it would appear that I require babysitting by friends 95% of the time! Ok, maybe babysitting is a little harsh but I pretty much seem to need to talk to my friends non stop either by email, phone or in person throughout the day. I do of course break to work, cycle, sleep and spend some time with Jon but other than that, I can keep my conversations going through meals, shopping expeditions – even in the bath. This might not seem like an important revelation in the great scheme of things but in noting it, I have realised that it is something that is very likely to change once our baby is born. I need to think about how I can continue to feel the support that I get from these relationships with my close friends when I will undoubtedly have less time to dedicate to them. Something else I became aware off when working through the one-page profile was that delivering our baby at home (being one of the two options currently available to me , the other being in hospital), might not be the best choice. It is possibly too early to come to this conclusion and I am sure there is much more to explore with Helen before we complete my person-centred birthing plan but I am conscious that some of the things that I have listed as important to me involve my home and are not necessarily conducive with a relaxed birthing environment. For example, I currently have a noisy neighbour who insists on playing rave music into the early hours. Imagine labour but instead of a chill out mix tape (complete with the essential Massive Attack’s Teardrop track) playing soothingly in the background, you are confronted with repetitive base beats vibrating through the floor boards. On the flip side, the idea of a home birth appeals because I think it would be more of a shared experience with my partner (again something that I have noted as important to me) – who won’t be sent home to sleep once the baby is born or have to leave us to get changed or eat as he would if I was in hospital. Lots to think about. My one-page profile set’s out what is important to me now and how best to support me. I will use it in pregnancy and plan to create another to use in birth. 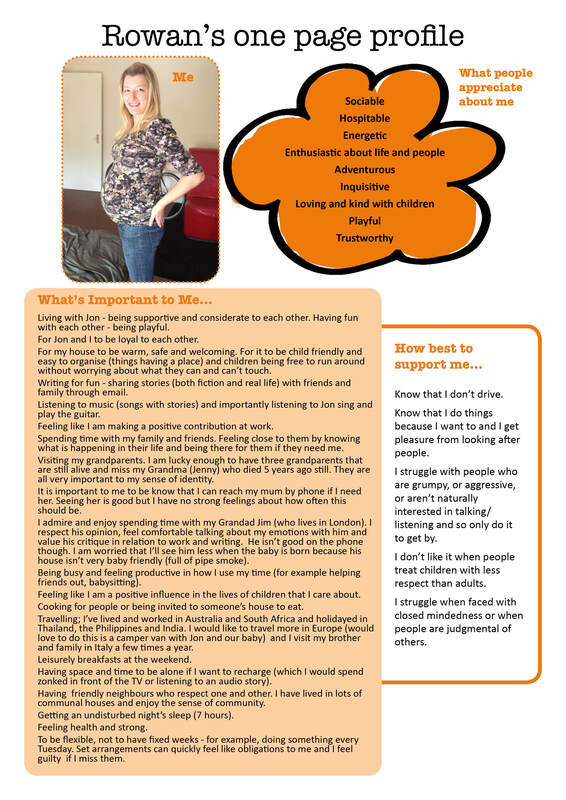 You can read more about one-page profiles in pregnancy and other person-centred thinking tools from the Pregnancy Parenting and Personalisation website. An example of how by introducing one-page profiles, this social care provider was not only able to improve the working experience for their staff, but form better, more cohesive teams and match individuals to each other, providing person-centred support. Marie works for Dimensions. 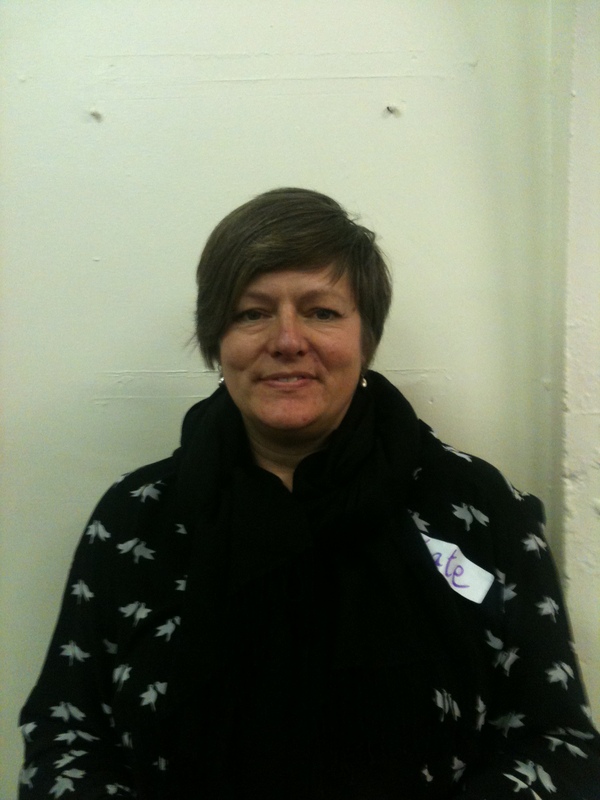 She is a member of a team that supports people with learning disabilities. In particular, she supports Denise who she knows very well, and with whom she is well matched. She is fun and active, yet likes to work in a very organised environment with a clear idea of what is expected of her. Marie developed her one-page profile for two main reasons. To help her fellow team members get to know her and her approach to work. And to help the matching process between herself and the individuals she supports. She talked to friends, family and colleagues to capture the things that people like and admire about her. Marie has always considered herself a team player and loves her job. Her frustrations used to come from not always knowing her place in the group and uncertainly over where and how she could be most productive and utilise her most effective skills. Marie’s whole team completed their one-page profiles together. They then took time to share them and used the information to discuss which roles each team member would flourish in. They also opened up about how best to support each other. This process helped Marie significantly. She felt she could take on work with confidence and communication with team members made sense and was constructive. The biggest benefit was that support workers were matched to the person they had most chance of developing a positive relationship with, and therefore providing the best support. Using one-page profiles not only arranged things so that Marie was supporting people she was best matched to, the whole team was clear about why and how best to support it to happen – a great way to build and maintain great, person-centred teams. Marie’s frustrations have disappeared. The content of her one-page profile has been useful and productive, and this has been a benefit for the whole team, and – most importantly – for people the team support.